PG-15F Pressure Test Gauges: Izumi Products. The PG-15F force test gauge was designed to check output force of REC-451F, REC-415B, 15B, CN-58A and EP-50 6 ton tools. It comes complete with necessary test dies for force measurement. The PG-325 is the inline pressure gauge to check inline pressure of the hydraulic system. The PG-58 was designed to measure the inner pressure of battery operated pistol type tools like REC-420, REC-S424, REC-S440, REC-485YC, REC-5PDF and REC-UC6E. 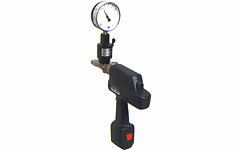 The PG-610A test gauge was designed to measure output force up to 15 ton. I needed spares for my hydraulic tools and was very happy with the service Izumi provided. Thanks again. High quality hydraulic compression, crimping, cutting tools and more. Order spares for current tools or for some discontinued tools. Need a tune-up? We offer servicing and repairs for your tools. Created by Edward Robertson web design with the Responsive Grid System.